A thread to discuss the local fire departments in Waterloo Region. What are everyone's thoughts on recent discussions of the Waterloo Fire Department to enter into a mutual service agreement with Woolwich, Wellesley and Wilmot Townships? These discussions were started about a week ago in response to a fire on the Woolwich side of Country Squire Road where a Waterloo fire station was about a kilometer away on University Avenue beside RIM Park, but Woolwich volunteer fire from 3 stations in Conestogo, St. Jacobs and Elmira responded. A similar incident happened a few years ago where a house on Wilmot Line caught fire and the residents died as a result. Is this the beginning of a move to a Regional fire service? I have a couple thoughts on this. A regionalized fire department could save money if it were limited to the urban areas of the region. For example, if Kitchener and Waterloo were to share resources the placement of their stations and the purchasing of equipment and training, not to mention administration, could be a benefit to all. To regionalize the entire region would likely require building new stations in the rural areas and staffing them solely for the reasoning that the people are paying for full time fire services and expect the same level of response as in the cities. The amount of fires in these areas I am guessing don't support paying full time fire fighters to sit around for weeks on end with no fire to put out, but God forbid one happens and the RFD doesn't show up within "X" number of minutes. The current set up of volunteer fire departments I would expect are real cost savings. If there Waterloo Fire Department were to respond to fires at the Farmer's Market (Woolwich)-- that would make sense. It is 2km from the Northfield Station. If they are expected to respond to Elmira and beyond, it really doesn't make much sense in my opinion. What cost increases are they proposing to the residents of these townships? My other thought is the politics. 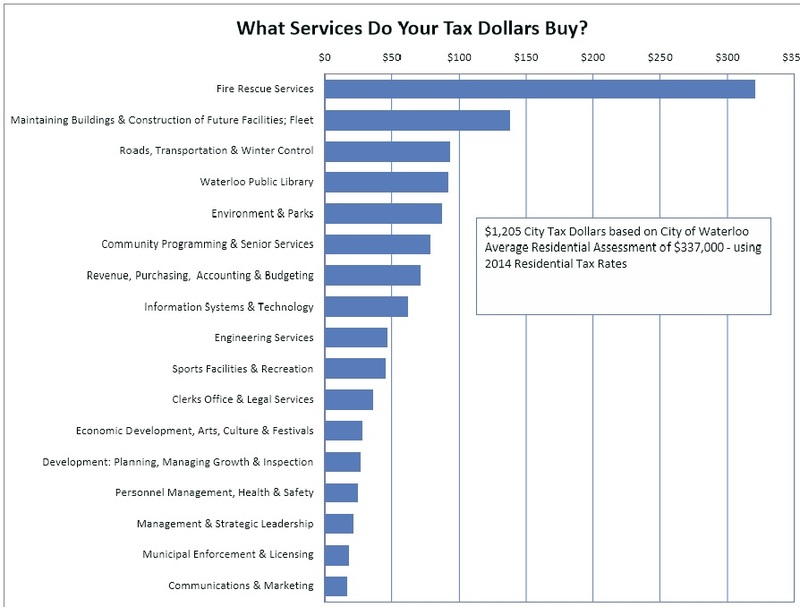 The city of Waterloo by far pays the largest line item in their budget to their Fire Department. I really question why Waterloo would need to exist if this item moved to the regional budget instead. I wonder if this is what is really holding back the move to regionalize the fire department. The city of Waterloo by far pays the largest line item in their budget to their Fire Department. The cost of fire departments is a big issue for municipalities across the country. Firefighters have succeeded in getting steady pay increased over the years, and yet there are far fewer fires than there used to be (and yet more firefighters). A greater percentage than ever of the calls is going to traffic accidents (have you ever noticed a couple of full-sized fire trucks at a fender-bender on the 401?). Managing and containing fire department costs will be an ever-bigger challenge in the future. Would it be easier with a regional fire department? I honestly don't know. It is strange that we spend lavishly on fire departments and then EMS gets just barely enough to manage. (04-23-2016, 08:45 PM)jamincan Wrote: It is strange that we spend lavishly on fire departments and then EMS gets just barely enough to manage. ... and then we send firefighters (and massive fire trucks) to do EMS teams' jobs. This is a great point. I do not know why paramedics are paid so poorly. Their job requires a lot of education and they are absurdly busy compared to the FD. I think cities like Chicago and New York have the right idea - their EMS is a part of the fire department, sharing their facilities, making common responses. Many firefighters are cross-trained as EMTs. This makes sense for logistic efficiency and also gives real financial savings, I understand. The firefighters have a better union? Are paramedics paid poorly, or is it that firefighters are over-paid? (04-23-2016, 11:53 PM)Drake Wrote: This is a great point. I do not know why paramedics are paid so poorly. Their job requires a lot of education and they are absurdly busy compared to the FD. The discrepancy between paramedic and firefighter pay certainly seems too large. Firefighters in Cambridge make $100K and up, plus overtime, benefits and retention bonuses. (04-24-2016, 09:14 AM)panamaniac Wrote: The firefighters have a better union? Are paramedics paid poorly, or is it that firefighters are over-paid? Retention bonuses. Because the colleges don't crank out more qualified candidates than can ever be absorbed! And this for what is, in some ways, a part-time job that lets you pursue a second career simultaneously. I'd say "nice gig", except for that life-threatening/cancer causing element. Not that throwing money at them helps overcome that in any practical way. I think there is an argument to be made that firefighters are overpaid, but I think the bigger issue is that EMS is understaffed. Part of the staffing issue for EMS is related to wait times in hospitals, which is another issue entirely. I think the thing with firefighters is that they have so much free time that they can afford to spend time doing community outreach - toy drives, school visits and what not - which makes them that much more visible to the public and reenforces the heroic image of the firefighter in children. EMS can't afford that sort of outreach because they actually have to work during their shifts. There has actually been a push by firefighters recently to be allowed to start to take over some of the medical protocols such as administering certain medication that has traditionally been strictly the responsibility of EMS. The logic being that firefighters are almost always the first responders, and the earlier we can provide treatment, the better. This also acts as another justification for fire department budgets, incidentally. There are issues with this of course, inadequate training and education being chief among them, and it raises the question why we don't simply shuffle a little bit of money from one department to the other. The biggest reason is likely because they are a municipal responsibility while EMS is a regional one. This also means that you can bet that the fire departments will fight tooth and nail to remain municipal departments because downsizing would be a lot easier at the regional level. (04-24-2016, 11:52 AM)jamincan Wrote: I think there is an argument to be made that firefighters are overpaid, but I think the bigger issue is that EMS is understaffed. Part of the staffing issue for EMS is related to wait times in hospitals, which is another issue entirely. You mean because EMS workers have to stay at the hospital until the patient is admitted? Yeah, although my sister says that it's much less of a problem than in used to be. I'm thinking there could be "edge agreements" that would work just peachily in this situation. Draw a line that delineates an area outside of the municipal boundaries that the FDs agree to service, negotiate pay schedules (I'm guessing fee-for-service wouldn't fly :S) and contract duration (people buying/building houses would like to know if the FD is likely to "downgrade" to VFD in the next year or two)... badda-bing. I confess I did not know that FDs were the largest item on the budget (and by _that_ much). But I also don't know what I'd fund more than FDs. What's the Regional budget look like for comparison? PDs/EMS at the top with as much margin? I don't suppose anyone knows off-hand how much (proportionally) other similar municipalities pay? One way to determine if we're over/underpaying is to compare how much similar markets pay for the similar services.